Former Rep. Beto O’Rourke (D-Texas) put President Trump’s immigration policies front and center at his formal presidential campaign launch Saturday, heaping praise on what he says are the advantages of welcoming migrants into the country. “We have learned not to fear our differences, but to respect and embrace them. We see the languages spoken in this community, the traditions, the cultures, as a strength for El Paso." O’Rourke’s comments on immigration came a day after as Trump unleashed his latest salvo against congressional Democrats over immigration, blaming them for promoting “weak” immigration laws and ramping up his threats to close the southern border. The Texas Democrat blasted the administration’s signature immigration policies on Saturday in the first of a string of campaign rallies to launch his campaign, using a nearby bridge under which undocumented migrants are detained as a metaphor for the kind of platforms he would reverse as president. “Let us reunite every single one of those families that are still separated today. And let’s remember that every single one of us, including those who are just three or four blocks from here detained under the international bridge that connects us with Mexico behind chain linked fence and barbed wire that they are fellow human beings and deserved to be treated like our fellow human beings,” he said. “For too long in this country, the powerful have maintained their privilege at the expense of the powerless. They have used fear and division in the same way that our current president uses fear and division based on the differences between us of race, of ethnicity, of geography or religion to keep us apart. To keep us angry, to make us afraid of ourselves and of one another,” he said. O’Rourke also went after the White House’s foreign policies, saying he would shun relationships with dictators and make efforts to rejuvenate alliances that have atrophied under the weight of Trump’s grievances over trade imbalances or shared defense spending. 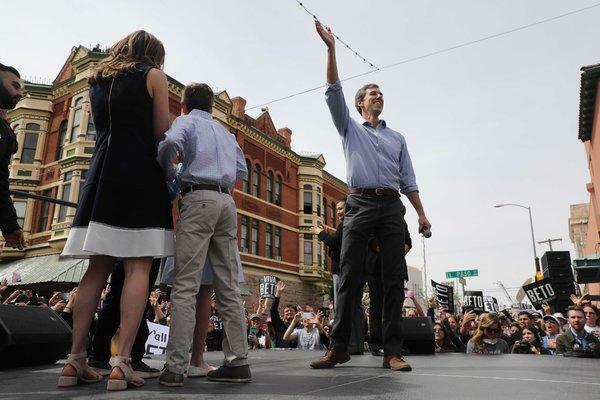 Though O’Rourke was able to haul in $6.1 million within the first 24 hours after announcing his campaign earlier this month, and consistently polls in the top tier of statewide and national polls, he has struggled to surpass Trump or open up large leads against the president in surveys of key states.